The Sanguine Rose (sometimes called Sanguine's Rose) is a Daedric artifact created by the Daedric Prince Sanguine. 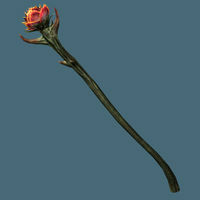 It can take on many forms, including that of an actual rose, a wooden stave carved like a rose or a staff-sized rose. Although powerful, the Rose is not an artifact most would care to possess. It can be used to summon a lesser Daedra, who will attack all except the holder. The Daedra is uncontrollable, unlike those summoned by Conjuration, but as with conjured creatures it is only bound to the mortal plane temporarily. Each time the Rose is used it wilts a little, and when all the petals fall off, it loses its power. When this happens, a new rose blooms somewhere in Oblivion and is plucked by Sanguine to be given to another champion.For more information see the main Lore article. 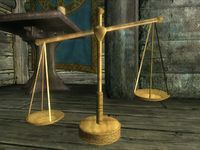 The Scales of Pitiless Justice are a legendary set of scales possessed by the Dark Brotherhood. The scales have a powerful enchantment, although its effects vary. Circa 2E 583, the Brotherhood seemingly used the scales to bless high ranking members. For those affected, bounties placed on their heads for murder and assault would fade far more rapidly. In 3E 433, the scales were possessed by Vicente Valtieri, a vampire member of the Brotherhood's Cheydinhal sanctuary. They were offered as a bonus reward for a contract within the Imperial Prison, in return for sparing the lives of any guards encountered. At the time, the scales were used to magically enhance the bearer's strength, intelligence and agility, but at the cost of their personality. It is unknown if the bonus was actually given. 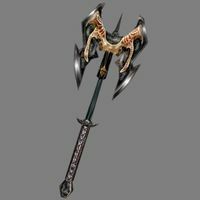 Scourge (also known as Mackkan's Hammer, Bane of Daedra, the Daedric Scourge, or Scourge, Blessed of Malacath) is a legendary Daedric artifact. It was forged from sacred ebony in the Fires (or Fountains) of Fickledire, and is associated with Malacath. 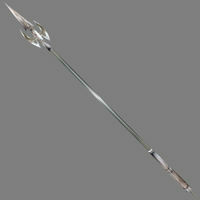 It is a fierce weapon, and takes the form of a steel or ebony mace. Malacath dedicated it to mortals, and any Daedra who attempts to invoke its power will be banished to the Void. It also has the ability to banish them to the Void with a single blow, and can conjure Daedra such as Dremora and Scamps from Oblivion to do the wielder's bidding. It has been described as a "bold defender of the friendless", which could be related to Malacath's role as the Daedric Prince of outcasts. Scourge was once used by Mackkan, who banished many of Mehrunes Dagon's minions with it. 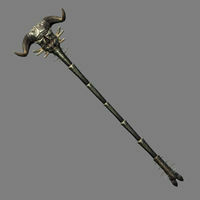 The mace eventually came into the possession of the Third Empire and was hung in the armory of the Battlespire. The Shadow Legion used it against the Daedra Lords in the name of the Emperor. 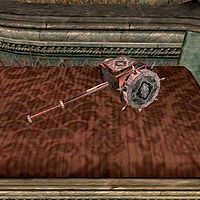 In the aftermath of Dagon's invasion of the Battlespire during the Imperial Simulacrum, the hidden mace was recovered from the Caitiff section of the Battlespire by a battlemage apprentice and used to help fight back against the retreating Daedric forces. A Daedra named Wonshala Keriayn was interested in obtaining the mace in return for a piece of the Battlespire's shattered voidguide, but she was banished after attempting to wield it. Scourge survived the ensuing destruction of the Battlespire, and was returned to Tamriel. It now wanders the land with adventurers. The mace once came into the possession of Divayth Fyr, who kept it in Tel Fyr, a Telvanni wizard tower in Morrowind's Zafirbel Bay. The Nerevarine supposedly liberated the weapon from Fyr's collection in 3E 427. Seht's Affect Inducer is a device that could manipulate a person's emotions. Created by Sotha Sil, the device was originally entrusted to Barilzar. Around 2E 582 High Magistrate Rinwaray of The Divine Prosecution (posing under the identity of Penewen with an enchanted necklace) manipulated Telenger the Artificer to use his teleportation device, The Hyperagonal Locational Determinator on her to teleport her into the Clockwork City. She planned to obtain the Affect Inducer from the city so she could use it on Proxy Queen Alwinarwe for her own political gain and to revert the Summerset Isles to isolationism. Her efforts were stopped when Razum-dar caught wind of her plot and followed her tracks through the Clockwork City, the Evergloam, Artaeum (accidentally) and eventually caught her in Alinor where he managed to subdue her and now awaits the Queen's judgement. Shadowrend is a Daedric artifact which takes the form of a shadowy two-handed ebony weapon. It is associated with the Grove of Reflection in the Shivering Isles, an underground chamber which can only be accessed by those the grove deems worthy. The grove has the potential to "show men who they truly are"; an ancient runestone in the center of the grove has the power to summon a shadowy doppelganger of anyone who approaches. These doppelgangers have been known to wield Shadowrend in battle, and those who manage to defeat their shadow may then claim the weapon for themselves. 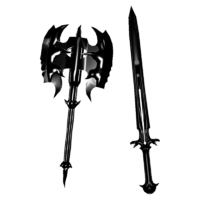 Shadowrend can appear as both a claymore and a battleaxe (indeed, both can appear together), but only one version of the weapon may be wielded. Both versions are powerful weapons in their own right, and are known to bear enchantments which damage health or cause weakness to magic. The claymore version is known to sometimes possess decorative serpentine imagery on the hilt. In 3E 433, the Champion of Cyrodiil was sent to the Grove of Reflection by Dyus of Mytheria in order to mantle Sheogorath and stop the Greymarch. Dyus required a screaming branch from the Tree of Shades in order to craft the physical shell of the Staff of Sheogorath, but the Tree did not give up its branch willingly. A shadowy doppelganger wielding Shadowrend was summoned when the Champion entered the grove, but the Champion successfully defeated the shadow and claimed the weapon. It is unknown if the Champion recovered the claymore or the battleaxe version of Shadowrend. In 4E 201, a shadowy anomaly appeared in a geyser pool in Eastmarch, surrounding some skeletal remains. The Last Dragonborn was drawn to the pool by an inner voice, and approaching the anomaly caused Shadowrend to be summoned. The weapon pulled a dark shadow from within the Dragonborn, creating a hostile doppelganger. With the shadow defeated, the Dragonborn was able to claim Shadowrend, and could utilize the anomaly in order to switch between the claymore and battleaxe at will. The Shield of Ysgramor was buried within the tomb of that famous hero of the Nords in the Late Merethic Era. It's unknown if Ysgramor ever wielded this shield in battle; legend only mentions his use of the axe Wuuthrad. In 4E 201, it was found by members of the Companions within the tomb. The wielder of the shield is both harder to kill and resistant to magic. 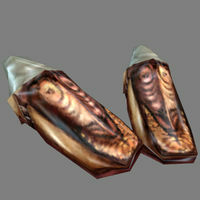 The Shoes of St. Rilms the Barefooted are artifacts sacred to the Dunmer. They make the wearer more fit and personable. The eponymous saint gave away the shoes and did her best to appear as a beggar in order to better acquaint herself with the poor. In 3E 427, the Nerevarine was sent by the Tribunal Temple to retrieve the shoes from an ancient Chimeri ruin, and later received the shoes as a reward for various services to the Temple. A Sigil Stone is a pre-Mythic quasi-crystalline morpholith that has been transformed into an extra-dimensional artifact through the arcane inscription of a daedric sigil, which can be used to create portals from Mundus to Oblivion. They are spherical objects, and emit both a humming noise and a dark red glow. The morpholiths used to create the Sigil Stone can only occur in pocket voids of Oblivion, and harvesting them requires Daedric assistance. The cleansed morpholith must then be presented to a Daedra Lord to perform the inscription of the sigil, which will transform the specimen into a true Sigil Stone. The Daedra Lord and the mechanic of the Sigil Stone must then jointly invoke the conjurational charter, which will transport the Stone through the liminal barrier and create a temporary portal. The portal only remains open for a brief period of time, depending on the strength of the liminal barrier at the chosen location; the longest recorded time under these circumstances was only a few minutes, making this type of portal rather useless. The power of a Sigil Stone is similar to that of a filled soul gem, but much stronger. Many ready-made sigil stones can be found in Oblivion, and can be obtained by powerful conjurers who force an unbound Daedra into submission. Dremora are often used for this purpose, although their Lord Mehrunes Dagon is angered by this theft. Although mainly used by Mehrunes Dagon, Sigil Stones are known to also be used in other realms of Oblivion such as Coldharbour. During the Oblivion Crisis, the loss of the Dragonfires caused the liminal barrier to slowly weaken and allowed these liminal bridges to remain open indefinitely. This was exploited by the Mythic Dawn and Mehrunes Dagon, who created Oblivion Gates to the Deadlands, allowing the Daedric forces to invade Tamriel. 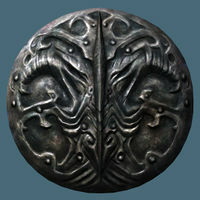 A method of destroying these Gates was discovered by the Champion of Cyrodiil at the Sack of Kvatch: removing the Sigil Stones from the well-defended keeps in the Deadlands where they were hidden would break the connection, teleporting those near the Stone back to Mundus and destroying both the Oblivion Gate and its Sigil Keep in the process. Occasionally, Gates would have multiple Sigil Stones supporting the link, and all of them would need to be removed to shut the Gate; similarly, one Sigil Stone may support multiple Gates. This technique for opening portals was exploited at the Battle of Bruma by the united forces of Cyrodiil (led by Martin Septim) to procure a Great Sigil Stone, a more powerful specimen used to sustain larger portals such as the "Great Gates". Each Oblivion Gate which was opened weakened the liminal barrier, eventually completely diminishing it and allowing Mehrunes Dagon pass fully into Mundus. The barriers were restored when the Amulet of Kings was smashed, summoning the power of Akatosh to banish Dagon. Sigil Stones have other uses apart from sustaining liminal bridges. One was used as an opposing force to a Great Welkynd Stone to open a portal to Gaiar Alata. Daedric Siege Crawlers use them as a power source. The arcane power of a Stone can be used in enchanting, consuming the Stone in the process. 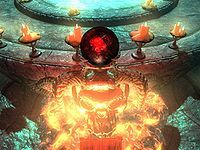 Powerful conjurers require Sigil Stones for use in rituals to summon items and Daedra from Oblivion when using an Atronach Forge, although the Stone isn't necessary when summoning lesser objects. Sigil Stones can also be used to create less permanent portals to Oblivion, which can be opened at will as long as the Stone remains intact, although this method binds the stone to a particular location in Mundus. Sinweaver is an artifact once wielded by Azani Blackheart, a Redguard outlaw and an avid scholar of the Ayleids. It is an Elven claymore, possibly of Ayleid origin. Its enchantment inflicts magical fire damage and drains the stamina of those that it strikes. Circa 3E 433, a wizard named Argoth employed the Fighters Guild to invade Blackheart's base, the Ayleid ruin of Arpenia, and recover Sinweaver. A large group of warriors were sent to the ruins, but were successfully repelled by Blackheart. Fifteen guild members died, including the son of Guildmaster Vilena Donton, and many more were injured. Argoth turned to the Blackwood Company to complete the job. However, the Company double-crossed Argoth and seemingly made a deal with Blackheart: if he gave them Sinweaver and departed from Arpenia, the Blackwood Company would pay him off and reveal Argoth's location. Blackheart agreed, and subsequently killed the wizard, retrieving his weapon. He then moved his base to Atatar, another Ayleid ruin not far from Arpenia. Seeking to defame the rival Blackwood Company, Fighters Guild second-in-command Modryn Oreyn, along with a new recruit, investigated the abandoned ruins of Arpenia. Oreyn's suspicions proved correct when he found the place free from any signs of battle. The two then journeyed to nearby Atatar, which was being guarded by Blackheart's bandit allies. After fighting their way into the depths of the ruins, Oreyn and the recruit confronted Blackheart and killed him, avenging their fallen comrades. Oreyn took Azani's ring as proof that the Blackwood Company had not completed their contract, and Sinweaver was taken by the recruit. The first supposed wielder of the Key was the thief Arrovan. After disappearing, the Key always chose inaccessible places to hide, and for the benefit of historians Arrovan made a list of the various resting places. In the mid-Second Era, the key was in the possession of Sotha Sil, who kept it in his Clockwork City. 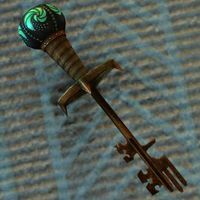 After the key was used by Nocturnal in a plot to take over the Clockwork City, Sotha Sil gave the Skeleton Key to the Telvanni wizard Divayth Fyr for safekeeping. The Skeleton Key was later uncovered during the Imperial Simulacrum by the Eternal Champion in either Valenwood or Summerset Isles (reports vary) while following rumors of the Key having appeared in one of the known dungeons. In the events leading up to the Warp in the West, an unknown agent of the Blades was tasked by Nocturnal to kill a mage in his stronghold. The agent was then gifted the Key by a worshipper of the Prince. The Key later came into the possession of Gentleman Jim Stacey, leader of the Thieves Guild in Vvardenfell. The Key was passed on to the Nerevarine in 3E 427, although how Stacey came to lose it is unclear: some say it was in return for killing Sjoring Hard-Heart, the Master of the Vivec City Fighters Guild, while others say the Nerevarine took it by force. The Skull Crusher is an amazingly large and powerful weapon. The warhammer was created in a fire magically fueled by the wizard Dorach Gusal and then forged by the great weaponsmith Hilbongard Rolamus. The steel is magically hardened and the weight of the weapon is amazingly light, which makes for more powerful swings and deadly blows. It was to be put on display for a festival, but thieves got it first. It is said the weapon still travels Tamriel in search of its creators. The Nerevarine reportedly recovered the warhammer and sold it to the Mournhold Museum of Artifacts in 3E 427. 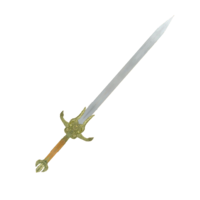 The Soul Sword is a shimmering longsword imbued with the soul of Prince A'tor following his death in 2E 864. 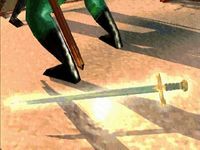 Aside from being a powerful weapon, the sword can move of its own accord and allows A'tor's spirit to communicate with the wielder. During the Battle of Hunding Bay off the coast of Stros M'Kai, A'tor was hit with a poison arrow by the Dunmer assassin Dram, allegedly using the Bow of Shadows. Archmage Voa attempted to heal him, but instead was only able to trap his soul in a soul gem and preserve his body under a stasis field before the dragon Nafaalilargus killed everyone onboard the ship. A'tor's surviving supporters formed a rebel group named the Restless League on Stros M'Kai following the ensuing Imperial occupation. The League planned to resurrect A'tor, whose body was being hidden in the temple of Arkay in Port Hunding. Iszara, a member of the League who was close to the prince, grew frustrated with the League's lack of action and attempted to go through with the resurrection herself. She made contact with the Sload necromancer N'Gasta, who promptly betrayed her, stealing the soul gem and selling Iszara's soul to Clavicus Vile. Seeking to curry favor with the island's new ruler, Provisional Governor Amiel Richton, N'Gasta had A'tor's soul gem delivered to the palace, ironically by Iszara's brother Cyrus. It was then placed in the palace treasure vaults, to be guarded by Nafaalilargus. Cyrus later rescued Iszara from her fate and killed the dragon to retrieve the soul gem for the rebels. With the help of a Yokudan witch named Saban, the League then attempted to resurrect A'tor. Instead, his soul entered the sword he was buried with, seemingly as a symbol of his intention to take up arms against the Imperials. Cyrus took up the sword and gave a speech to the disheartened rebels, inspiring them to capture the port while Cyrus went after Governor Richton. Through the sword, A'tor opened a secret entrance into the palace. Cyrus fought his way to Richton, who was attempting to escape on a Dwemer airship. Cyrus disarmed Richton, but was outsmarted and forced to surrender when Dram came up behind him. After dropping the sword however, Cyrus revealed that A'tor had not truly been killed, prompting the sword to slay both Richton and Dram of its own accord and allowing Cyrus to escape. Following the successful rebellion, the Soul Sword was given to Iszara. Through it, A'tor advised her to open dialogue with Emperor Tiber Septim, which led to the signing of the First Treaty of Stros M'Kai. She subsequently remained on Stros M'Kai as ruler. The Spellbreaker (also spelled Spell Breaker) is an artifact attributed to the Daedric Prince Peryite. 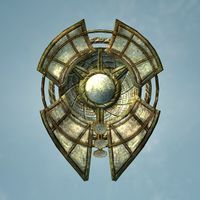 Superficially a Dwarven tower shield, it is one of the most ancient relics in Tamriel. The shield not only protects its wielder from physical damage, but also from magical attacks, by reflecting magicks, dispelling curses, or silencing any mage about to cast a spell. It is said that the shield still searches for its original owner, and will not remain the property of anyone else for long. It played an important role in the historic Battle of Rourken–Shalidor. Some time during the First Era, Spellbreaker was granted to the Dragon Priest Zaan the Scalecaller. After being abandoned by her Dragon lord, Zaan turned to Peryite—earning his favor and shield—before being killed by her dissatisfied followers. Around 2E 583 Zaan was awoken from death by a cult of Peryite, with whom she cooperated to unleash a terrible plague on Tamriel. Zaan was defeated by members of the Undaunted—but Spellbreaker was retaken by Peryite before they could claim it. The shield was uncovered by the Eternal Champion during the Imperial Simulacrum, in either Hammerfell or Valenwood (reports vary). In the events leading up to the Warp in the West, an agent of the Blades contacted Peryite in search of power. The agent reminded the Prince of a mortal from the First Era, and Peryite took a shine to the agent. He had the agent slay a Vampire Ancient who had displeased him, and in return he had one of his worshippers give the Spellbreaker to the agent. Mastrius, a Dunmer vampire who had been imprisoned for centuries in the Salvel Ancestral Tomb near the Red Mountain of Vvardenfell by Azura, required the Spellbreaker to break the curse keeping him in his prison. In 3E 427, the weakened Mastrius was discovered by a fellow vampire who agreed to help free him. The Spellbreaker was found in the Dwemer ruin of Bthuand, near the skeleton of its previous owner who had died in a cave-in. Mastrius used the shield as a conduit for his spell and broke Azura's curse, returning to full strength. He then betrayed his fellow vampire and was slain; his accomplice then claimed the Spellbreaker. Later that year, the shield came into the possession of Torasa Aram and was put on display in her museum of artifacts in Mournhold. In 3E 433, worshippers of Peryite in Cyrodiil attempted to become closer to the Prince by performing a risky ritual which resulted in trapping their souls in Peryite's realm of Oblivion, the Pits. The Champion of Cyrodiil found the frozen bodies of the worshippers around Peryite's shrine by the Silverfish River. The Prince spoke with the Champion, and requested that they enter Oblivion and retrieve his worshippers' souls. The Champion obliged, and was rewarded with the Spellbreaker. In 4E 201, the Last Dragonborn summoned Peryite and was tasked with killing the Bosmer Orchendor, a monk of Peryite who had rebelled against the Prince. He dwelled in the Dwemer ruin of Bthardamz in Skyrim, along with many Bretons from High Rock who had been cursed by Peryite with a terrible plague. The Dragonborn infiltrated the ruins, killing the afflicted Bretons before defeating Orchendor and sending his soul to the Pits. Peryite rewarded the Dragonborn with the Spellbreaker. The Staff of Hasedoki belonged to the wizard Hasedoki, who was, to the best of all knowledge, the greatest wizard of his time. It is said that he felt so lonely and isolated because so many feared his power, that he bonded his soul into his very own staff, where it remains. Magic users all over Tamriel have been searching for it ever since to benefit from its magical protection. 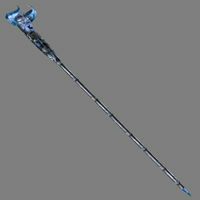 In appearance, the Staff of Hasedoki is an engraved metallic staff decorated with a horned blue head at its tip. 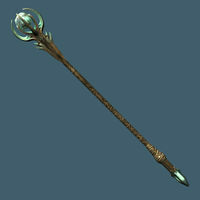 When used, the staff grants its wielder powerful resistance against magicka. Circa 3E 427, the keeper of the staff was an Orc sorceror named Koffutto Gilgar. He sealed himself within the master burial chamber of the undead-infested Gimothran Ancestral Tomb in the Molag Amur region of Vvardenfell. A pair of adventuring knights named Vulpriss Denisson and Morty sought to claim the staff, but Morty was then slain in the Baram Ancestral Tomb far to the northwest. Vulpriss attempted to enter Gimothran Tomb alone but perished while attempting to disarm a trap. 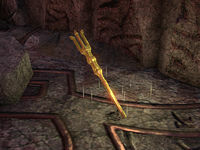 The Nerevarine subsequently recovered the staff and sold it to the Mournhold Museum of Artifacts. The Star Teeth are magical prismatic crystals taken from the skies by Ayleid Airships during the Merethic Era. Seven Star Teeth were captured by the Airships. The crews of the Airships believed them to be fire gods from the night sky. The Teeth were artifacts of light, in some way associated with the stars; the Ayleids believed starlight to be the purest form of the element. The Star Teeth had the ability to counteract powerful Shadow Magic. 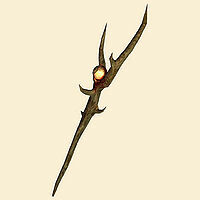 The descent of the Star Teeth matches the description of "shooting stars", Aetherial Fragments falling to Nirn from Aetherius; this would imply that they are made of Meteoric Glass. The Star Teeth appear structurally similar to Welkynd Stones, but without the capability to store magicka. Although apparently impossible to control, the Teeth emit sporadic bursts of light. The true nature of their light magic remains unknown, but their potency is seemingly lessened by shade or darkness. The seven Star Teeth were traditionally held in the Vault of the Heavens in the Agea Relle, later known as the Crypt of Hearts. Placed on the pedestals there, they provided a powerful magical enhancement which could be used to fight creatures of shadow. The Ayleids later abandoned the Agea Relle, and in the early Second Era a school for adventurers was established in the ruins by two Altmer, Nerien'eth and Alanwe. Alanwe discovered the crystals on their pedestals, and named them Star Teeth due to their similarity to a row of teeth. After researching the Teeth, she attempted to weaponize their light by emulating their enchantment with a Welkynd Stone as a base. She hoped that their light magic could be used against Daedra and all manner of undead, or at least as reusable torches or paperweights should her experiments prove unsuccessful. Alanwe's plans were never realised, as her husband Nerien'eth fell under the influence of Mephala and killed her after claiming the Ebony Blade. The haunted Agea Relle became known as the Crypt of Hearts, and was avoided by the people of Rivenspire for many years. The ruins were eventually cleared of undead and Daedric influence in 2E 582. Azra Nightwielder, who was discovered and awoken by the hero, revealed that there were in fact seven Star Teeth, and five wouldn't be enough to defeat the Umbra' Keth. Azra warned Skelos Undriel that he would perish if he attempted it, but it is unknown if Undriel heeded his advice. The hero recovered all seven Star Teeth and encountered the spirit of Captain Nym in Glacier Crawl. Nym was a captain of one of the Airships which had originally captured the Teeth; his Airship crashed into the glacier long ago. Nym feared the plans of Jagar Tharn and Pergan Asuul, who both wanted to control the Umbra' Keth. Pleased with the hero's efforts to thwart their plots, Nym gifted the hero with the Star Coif, a very valuable lightweight helmet. Armed with the seven Star Teeth, the hero descended into the Crypt of Hearts and lured the Umbra' Keth into the Vault of the Heavens. This allowed the hero to defeat the Umbra' Keth, whose shadows were then shredded by sparks from the Teeth. The Star Teeth Greaves are a piece of valuable medium armor, but their relation to the Teeth is unknown. Similar crystals include Varla Stones, Welkynd Stones, Culanda Stones, Malondo Stones, Vakka Stones, and Stormhold Crystals. The Starfrost is a magical frost given to the champion of Dawnstar, a city along Skyrim's northern coast. It focuses the power of elemental winter and the prayers of Dawnstar's inhabitants through the user, and is seemingly used in times of war. With this power, the user is nigh immortal and cannot fall in battle. The Starfrost was given to a disgraced hero when Dawnstar was under siege by the Ice Tribes. After town's traitor was revealed, Dawnstar's three remaining champions were able to return from exile and hold the city walls, while the hero was given the Starfrost and ordered to kill any enemies that slipped through. The hero's good name was restored following a final battle with the Thriceborn Gehenoth, which ended the siege. 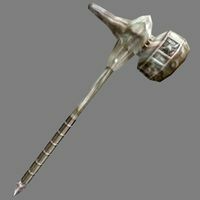 Stendarr's Hammer is a massive hammer rumored to have once been wielded by Stendarr, the God of Justice. It is made of ebony and sapphire. The weapon is enchanted to drain or damage the health of those it strikes, at the cost of the wielder's stamina. It was one of the first artifacts to be added to Torasa Aram's museum in Mournhold. The hammer is too heavy for most people to use in combat; it took four men to simply lift the artifact onto its display podium in the museum. Its origins are unknown, but it was still in Aram's possession circa 3E 427. 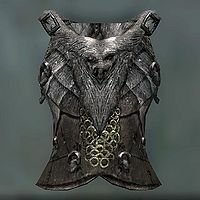 In the year 4E 201, it resurfaced in Calcelmo of Markarth's possession and was put on display in his private Dwemer museum in Markarth, though it was stolen soon after he acquired it. Sunna'rah was a powerful staff-like device created by the clockwork god Sotha Sil. Translated as the "blessed staff", it combines clockwork technology with magicka. It was used by Sotha Sil to study his divine powers. By draining minute pieces of his own energy into a reservoir, he could study it and then return the energy back into himself. This page was last modified on 17 January 2019, at 13:40.